The unwise subsidies, poor planning and global warming threat make floods worse. According to 'The Economist', the extent of the devastation of Hurricane Harvey will become clear only when the floodwater recedes, leaving ruined cars, filthy mud-choked houses and the bloated corpses of the drowned. But as we went to press, with the rain pounding South Texas for the sixth day, Hurricane Harvey had already set records as America’s most severe deluge (see Briefing). In Houston it drenched Harris County in over 4.5trn litres of water in just 100 hours—enough rainfall to cover an eight-year-old child. The fate of America’s fourth-largest city holds the world’s attention, but it is hardly alone. In India, Bangladesh and Nepal, at least 1,200 people have died and millions have been left homeless by this year’s monsoon floods. Last month torrential rains caused a mudslide in Sierra Leone that killed over 1,000—though the exact toll will never be known. Around the world, governments are grappling with the threat from floods. This will ultimately be about dealing with climate change. Just as important, is correcting short-sighted government policy and the perverse incentives that make flooding worse. 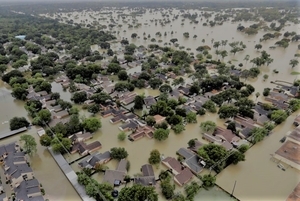 The overwhelming good news is that storms and flooding have caused far fewer deaths in recent decades, thanks to better warning systems and the construction of levees, ditches and shelters. The cyclone that struck Bangladesh in 1970 killed 300,000-500,000 people; the most recent severe one, in 2007, killed 4,234. 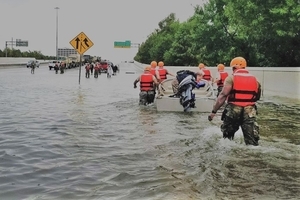 The bad news is that storms and floods still account for almost three-quarters of weather-related disasters, and they are becoming more common. According to the Munich Re, a reinsurer, their number around the world has increased from about 200 in 1980 to over 600 last year. Harvey was the third “500-year” storm to strike Houston since 1979. At the same time, floods and storms are also becoming more costly. By one estimate, three times as many people were living in houses threatened by hurricanes in 2010 as in 1970, and the number is expected to grow as still more people move to coastal cities. The UN reckons that, in the 20 years to 2015, storms and floods caused $1.7trn of destruction; the World Health Organisation estimates that, in real terms, the global cost of hurricane damage is rising by 6% a year. Flood losses in Europe are predicted to increase fivefold by 2050. One cause is global warming. The frequency and severity of hurricanes vary naturally—America has seen unusually few in the past decade. Yet the underlying global trend is what you would expect from climate change. Warmer seas evaporate faster and warmer air can hold more water vapour, which releases energy when it condenses inside a weather system, feeding the violence of storms and the intensity of deluges. Rising sea levels, predicted to be especially marked in the Gulf of Mexico, exacerbate storm surges, adding to the flooding. Harvey was unusually devastating because it suddenly gained strength before it made landfall on Friday; it then stayed put, dumping its rain on Houston before returning to the Gulf. Again, that is consistent with models of a warmer world. Poor planning bears even more blame. Houston, which has almost no restrictions on land-use, is an extreme example of what can go wrong. Although a light touch has enabled developers to cater to the city’s rapid growth—1.8m extra inhabitants since 2000—it has also led to concrete being laid over vast areas of coastal prairie that used to absorb the rain. 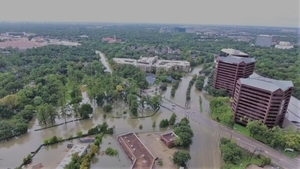 According to the Texas Tribune and ProPublica, a charity that finances investigative journalism, since 2010 Harris County has allowed more than 8,600 buildings to be put up inside 100-year floodplains, where floods have a 1% chance of occurring in any year. Developers are supposed to build ponds to hold run-off water that would have soaked into undeveloped land, but the rules are poorly enforced. Because the maps are not kept up to date, properties supposedly outside the 100-year floodplain are being flooded repeatedly. Government failure adds to the harm. Developing countries are underinsured against natural disasters. Swiss Re, a reinsurer, says that of the $50bn or so of losses to floods, cyclones and other disasters in Asia in 2014, only 8% were covered. The Bank of International Settlements calculates that the worst natural catastrophes typically permanently lower the afflicted country’s GDP by almost 2%. America has the opposite problem—the federal government subsidises the insurance premiums of vulnerable houses. The National Flood Insurance Programme (NFIP) has been forced to borrow because it fails to charge enough to cover its risk of losses. Underpricing encourages the building of new houses and discourages existing owners from renovating or moving out. According to the Federal Emergency Management Agency, houses that repeatedly flood account for 1% of NFIP’s properties but 25-30% of its claims. Five states, Texas among them, have more than 10,000 such households and, nationwide, their number has been going up by around 5,000 each year. Insurance is meant to provide a signal about risk; in this case, it stifles it.